Travelling by ship, whether for trade, exploration or war, has been one of the most important parts of human history. As the global economy progressed and developed, the importance of shipping skyrocketed. While the advent of the car and plane heralded new eras of transportation, shipping has always been of vital importance to humanity. Vessels have changed dramatically over the years, but continue to be responsible for the bulk of international trade. However, piracy continues to be a major problem, and as developed in line with International Shipping. Attacks cost the international economy an unparalleled amount of money, which explains why crews and companies go to such lengths to protect themselves. Piracy is synonymous with two images; swashbuckling, romanticized pirates of the past, and modern Somali pirates replete with assault rifles and RPGs. Both have been incredibly problematic for international shipping, and their ubiquity is not unfounded; Somali based Piracy cost the international community over $6bn in 2012 alone. Somalia is not the only source of Piracy either, and it is easy to see just how much these attacks impact on world shipping. However, the past few years has seen a decrease in Pirate attacks, and particularly in and around Somalia. There are many reasons for this, though one important cause is the increased reliance on Maritime Security. International Shipping makes up 80% of all world trade, and so it is no surprise that both pirates and Maritime Security Personnel are so common. Nevertheless, there are a variety of solutions available to vessels and shipping crews, each with their own advantages and disadvantages. While overall attacks may have decreased, piracy is still rife, and has shifted to areas of increasing trade and shipping. For example, there has been a dramatic rise in Piracy in South East Asia. Similarly, the scope of attacks has widened, meaning pirates are increasingly attacking any and all ships. Surprisingly, even warships can be targeted, with pirates attacking two separate warships in 2010. As part of this increase in scope, attacks are becoming more and more deadly, with Pirates increasingly using high-powered weapons. The ultimate aim of any attack is to board the target, which happens in 75% of all attacks. The methods used to stop this include ‘passive’ methods that aim to make boarding physically impossible and more aggressive solutions that directly combat Pirates. These range from Private Maritime Security, to advanced Acoustic Weaponry. The most aggressive methods are often seen as the most effective, as they are said to provide a more permanent solution to piracy. This is not necessarily true however, as attacks from pirates continue to increase despite a more concerted global effort to combat it. Nevertheless, having arms and armor available to crews is a popular method of providing security. The weapons used are not necessarily lethal, however, and non-lethal explosives for example have proven to be effective in keeping pirates away from ships. One of the more ‘fantastical’ examples of non-lethal weaponry is the Long-Range Acoustic Device (LRAD), which uses focused sounds well above the human threshold to incapacitate potential attackers without any permanent damage. 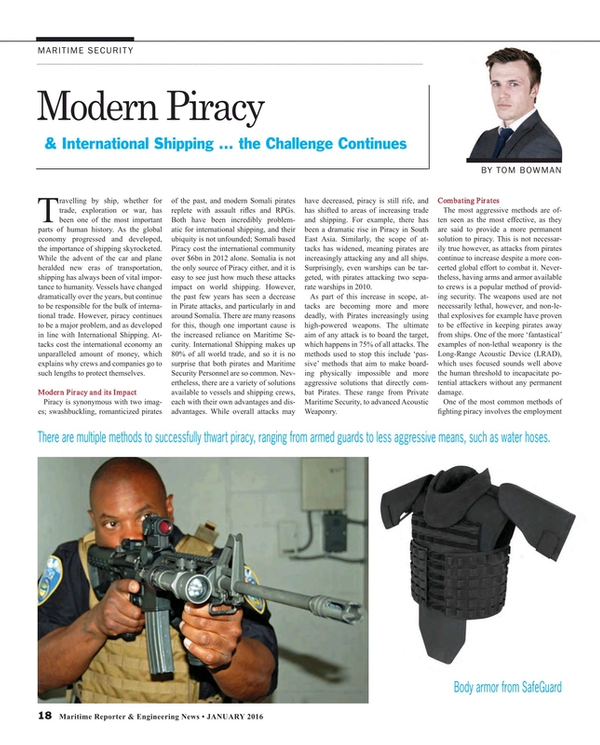 One of the most common methods of fighting piracy involves the employment of Armed Security. Studies have shown that the presence of Private Security dramatically reduces the chances of a successful Pirate attack, and simply by having Security Personnel present potential attackers can be deterred and crews can feel more confident in traveling through certain areas. Security forces can also make use of non-lethal weaponry, making them a more palatable solution for many crafts. This is important because piracy has increasingly shifted its sights to civilian crafts, and having discreet protection will be important to these vessels. This can be achieved by non-lethal weaponry and covert Kevlar vests, helping to keep the security forces secure. On the other hand, there are methods that seem far less aggressive. These methods are often referred to as ‘passive’ solutions, in that they offer static deterrents to Piracy, and in particular boarding. Water hoses, for example, are employed by many ships as a cheap yet effective method of preventing the boarding of a ship. Even at low pressures water hoses can be enough to deter and disorient Pirates, and when used in tandem with other methods can successfully keep ships safe from attack. Using foam, for example, can create slippery surfaces that will make boarding impossible even if Pirates can get past other methods being used. Other so called ‘passive’ methods are even less ‘active’ than the ones mentioned above, but are no less effective. One common example of this is barbed wire, which has been used on some ships simply to provide a psychological deterrence to pirates. Furthermore, it can make it far more difficult for Pirates to board a ship. One method which is completely passive, however, is for ships to simply change course and avoid the major areas of piracy. This does not necessarily guarantee the avoidance of an attack, however, but certainly reduce the likelihood. Research has shown though that piracy shifts to reflect major shipping routes, and evasion adopted en masse may only serve to delay pirates for a short while. Nevertheless, for some smaller ships evasion may be a viable method of avoiding attack.